A regional daily and a number of weekly newspapers look set to move to new bases as a result of Johnston Press’s £8m-plus office sell-off. As revealed by HTFP yesterday, the regional publisher has created a dedicated website to market current and former newspaper offices it wishes to sell or lease. Although JP proposes to lease back some of the properties up for sale, the sell-off means some titles will be looking for new premises. They include the Sunderland Echo, whose headquarters at the city’s Pennywell Industrial Estate are on the market for £850,000. 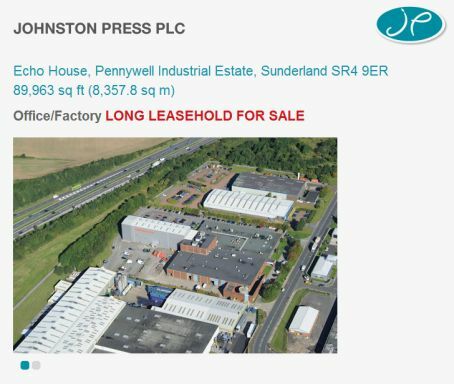 The Sunderland Echo's headquarters appear on a Johnston Press property website. The premises have been the main office for the Echo and its sister titles since 1976 but last year the company decided to close the print plant on the site and transfer most of its work to Sheffield. In a story about its plans to move headquarters, the Echo told readers earlier this year that it intended to remain in the Sunderland area. Managing director Stephen Plews said: “We are looking for more suitable premises in the Sunderland area. On the marketing website, the site is described as being two miles from Sunderland city centre and adjacent to the A183. Other titles likely to be on the move include the Chorley Guardian, whose Market Street offices are up for sale at £125,000, and the Burnley Express, whose HQ on Bull Street is valued at £160,000. 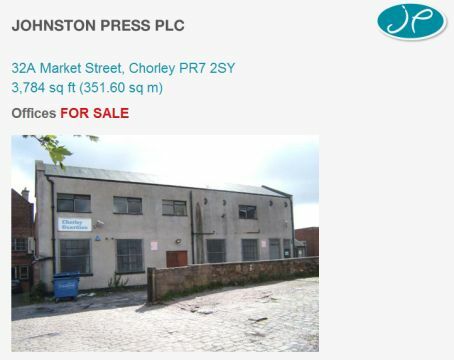 The offices of the Wigan Evening Post and Wigan Observer are on the market, with no guide price set, but the website states that JP may consider a short leaseback of the parts of the site it occupies if and when it is sold. The site on Martland Mill Lane in Wigan has been the base for the Lancashire titles since the early 1980s when it was purpose built, including a now-defunct press hall. The Nelson Leader’s former offices on Scotland Road are also up for sale for around £90,000. Also up for sale is the current base for the Morecambe Visitor, which has an asking price of £350,000. HTFP reported last year that the building on Victoria Street, which also houses the Lancaster Guardian, was for sale for £400,000 and, at the time, the company said it would look for alternative local premises for the titles. Johnston Press could make more than £8m from the sale of all the offices on its property website, along with more than £200,000 a year in rental income. The publisher said it was putting its buildings up for sale to ensure all its staff worked in “fit for purpose” offices, while also raising cash.